In the late 80s, a man named Ali Hassan al-Majid, who started his career in the Iraqi army as a motorcycle messenger, worked diligently with cousin Saddam Hussein to gas 5,000 Kurdish villagers in northern Iraq, thus earning him the nickname “Chemical Ali.” In all fairness to Ali, some say that Iran was responsible for the attacks, while still others claim the Kurds were “rebels” and the attacks therefore justifiable. 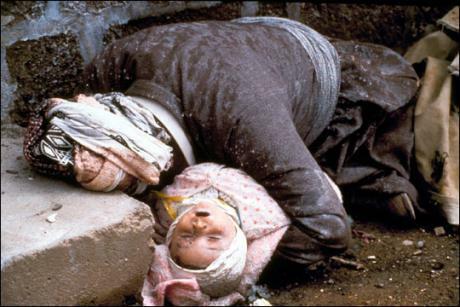 But whatever the reasons, Ali’s work was part of a larger campaign in the Iran-Iraq war, called al-Anfal, Spoils of War. The al-Anfal campaign killed some 100,000 Kurds, probably more. This would be like wiping out the population of beautiful downtown Burbank, home of Laugh-In and The Tonight Show, or maybe Rochester, Minnesota. Goodbye Mayo Clinic. A few years ago, Chemical Ali was convicted of genocide and war crimes, and was sentenced to death. He walked to the gallows yesterday. In response to his hanging, some of his fellow Sunnis organized suicide car bombings which killed 18 people in Baghdad. I suppose they thought this would be better than bringing flowers to the funeral reception. Death follows death. Swing long, Chemical Ali.